This page should load fairly fast for you, because the image file sizes are all pretty small. With Mexican processing, there is no more to be seen in a larger version! With that in mind, just wait 'till he gets to Nicaragua! 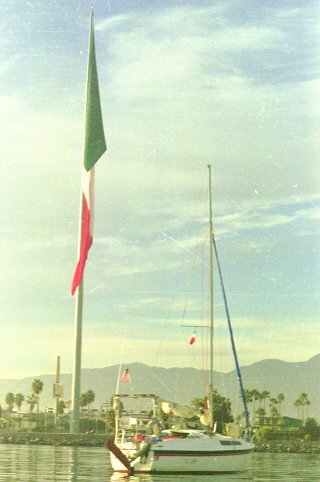 Still, these images tell the story... Ensenada, with a huge Mexican flag in the background. It takes 20 knots of wind to make it fly, and then it's too bouncy for a photo, so you get it on a calm day. 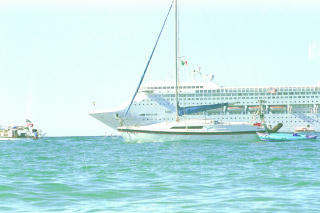 "WIND GIFT" and a Love boat, in Cabo San Lucas. "WIND GIFT" is the pretty one. A magnificent rock, guarding Isla Isabella A view of the shoreline, Isla Isabella. 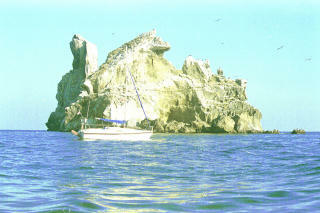 This is a nesting ground for the Magnificent Frigate Bird, so they are always soaring overhead. Bye - bye! Isla Isabella. Not very big, huh? Punta Graham. I'd like to think they named it after me. I'm going to have to find out how it was named. 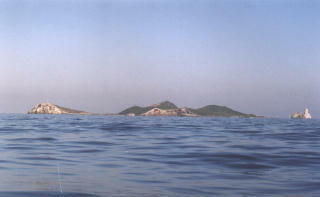 Manzanillo. See? No roads to the houses. 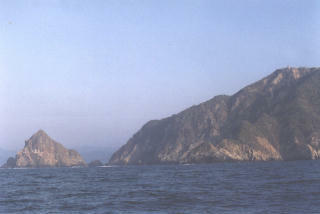 And here is a little story from Manzanillo: Manzanillo has little mountains right in the middle of it. Houses are built right up the mountainsides, on the North slopes. The South slopes are too hot. There are no roads to these houses; only stairs. Nobody has a car anyway, so who needs a road? It seems there is always music playing, all day long. Maybe a night club, or maybe just a loud radio, but it is pleasant to have background music all the time. To morrow, I eat fish. This is how it came about: I am anchored with the fishing fleet. 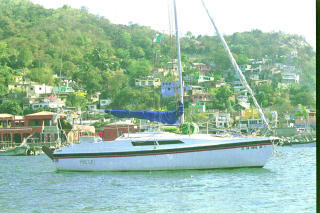 Most of the fishing boats are pangas. Yesterday, one came floating by, unattended. I put a line to it and started towing it back into shore. I was rowing, because I don't need my motor here, since everything is so close. 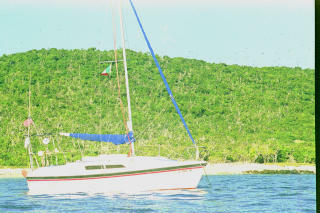 Then, along came a panga with a motor, and they towed me and my tow into shore, to the owner of the lost panga. So today when they came in from fishing, they gave me a free fish for saving thier boat. Please use the "back" button in your browser to return to the log.